Chris Breslin, who took over as President of Premier Farnell earlier this year has enjoyed similar success. It saw sales soar 7.2% to $379m in its first reporting quarter this year, and income grew 25%. For Digi-Key’s Doherty, new applications have been spur to the market. “People talk about IoT and that has just exploded, people needing help as they want to connect sensors to processors and connectors. So if you look at our website and the IoT solutions page, we can help engineers move from conception, into schematic and then into design. We will help them work that whole design chain,” he explained. To support these applications, Digi-Key has added 130 suppliers and over 200,000 new products between electronica 2016 and electronica 2018. 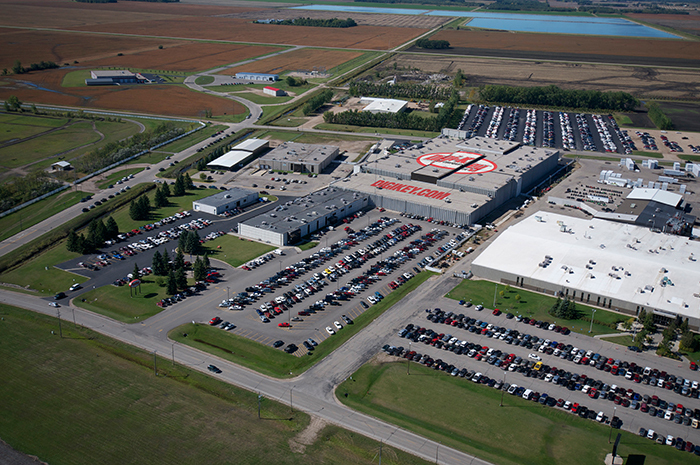 And as a mark of true confidence Digi-Key is cracking on with the build of a brand new warehouse facility at its Thief River Falls headquarters (pictured above). It may not be all plain sailing for distribution. Steve Rawlins, CEO at UK-based Anglia has a word of warning on prices. While advising customers that lead times on chip resistors and passives are now generally reducing – they are seeing 12-13 weeks now in some cases, this improved availability may lead to some price instability according Rawlins. DMASS, which represents distributors and manufacturers of semiconductors, reported Q3/2018 growth of 6.3% year on year to €2.3bn. The first three quarters show the same 6.3% increase to €6.91bn. By country and region, the growth spread in Q3/2018 is rather large, between +41% and -17%. Of the major regions/countries, Eastern Europe and Benelux led the pack, while Germany, Austria, Russia and Nordic trailed the average growth. In numbers, Germany grew by 2.4% to 700m Euro, Italy rose 5% to 193m, and the UK posted a healthy 9.5% increase to 166m Euro. France sales vaulted 9% to 155m Euro, Eastern Europe sales rocketed 15.6% to 375m Euro and Nordic edged forward 3.2% to 189m Euro. Steinberger added: “After nine months, it shows clearly that countries with a rather huge contract manufacturing focus are growing significantly faster than the major countries in Western Europe. And most of these contractor countries are in the East and to some extent the South of Europe. Although there have been some warnings on a slowdown by semiconductor companies, Arrow Electronics CEO Michael Long is also optimistic about 2019.